designed a 16-reactive scale evaluating: verbal aggression, physical aggression, humiliation and respect. type of crime by substance consumption, depression or family violence. & Marquez, 2000; Romero, 2003; Romero & Aguilera, 2002). Loeber, 2005; Hart, O’Toole, Price-Sharps, & Shaffer, 2007). are the criminal c onduct. behavior which in turn is a prelude to commit criminal acts. other of up to 94%. Among mental disorders, one that often occurs is depression. Burgess, & Clark, 2003; Stewart, Karp, Phil, & Peterson, 1997). Betancourt, Rendón, & Burns, 2012; Romero & Aguilar, 2002). report is the forced separation of the women and their children. tre (CERESO) the state of Morelos, Mexico. tioned living together (40% for women and 39.1% for men). ple te pr ima ry (27. 5%) and t hirdly, complete secondary (19.5%). and followed by incomplete primary (23.1%). was acceptable ( = .74). standing of this variables. Doubts were clarified. in a box before leaving the space where they are applied. of these variables and inferential analysis for hypothesis testing. those who were in prison for kidnapping, for men was murder. Type of crime committed by gender. Levels of violence, alcohol and depression by gender. followed by those who committed homicide (20.5%). murder and other crimes (15.2%, respectively). 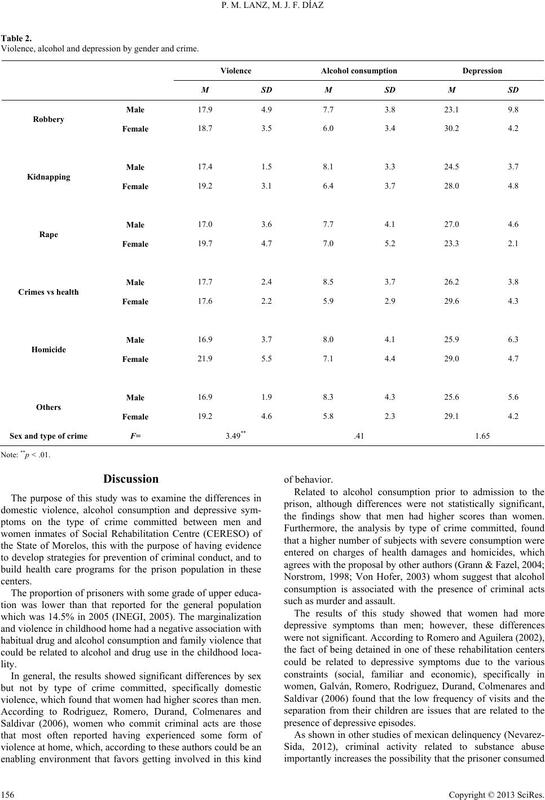 crimes except in health damages compared to men. Levels of violence by type of crime. Levels of alcohol consumption by type of crime. 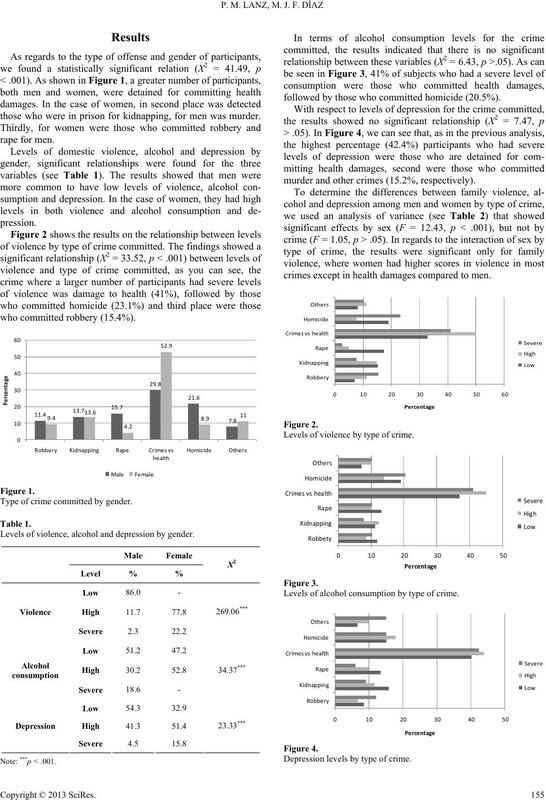 Violence, alcohol and depression by gender and crime. violence, which found that women had higher scores than men. the findings show that men had higher scores than women. such as murder and assault. mined by availab ili ty of the substances. and Community Psychiatry, 41, 1132-1134. Fagan, A. A., Van Horn, V. L., Hawkins, J. D., & Arthur, M. W. (2007). oners: A systematic review or 62 surveys. Lancet, 359, 545-550.
criminalidad en la esquizofrenia. Salud Mental, 25, 72-78.
cuencia juvenil. La Psicología Social en México, 8, 486-492. Swedish population study. British Medical Journal, 328, 1233-1234. 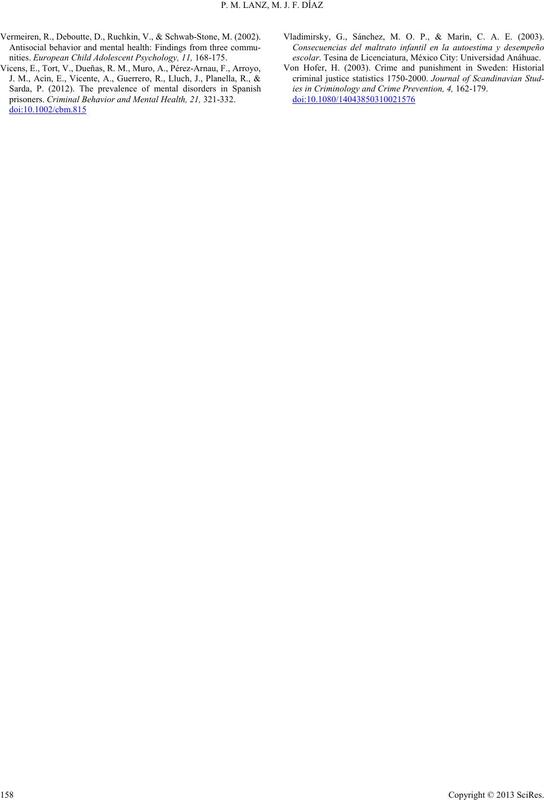 Hart, J. L., O’Toole, S. K., Price-Sharps, J. L. & Shaffer, T. W. (2007). women: The hidden health burden. Washington DC: World Bank. 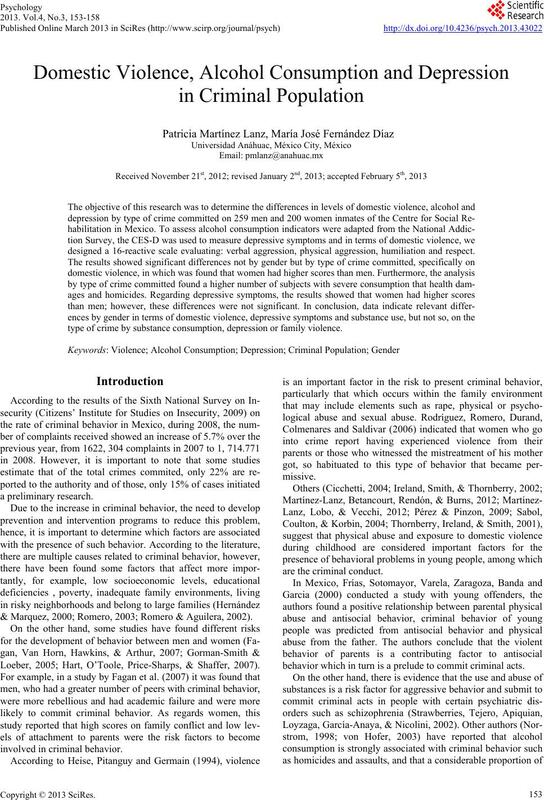 de la Salud, 10, 103-114.
lent juvenile offenders: Risk factors and successful interventions (pp. 47-67). Thousand Oaks, CA: Sage Publications. Nacional de Estadístic a Geografía e Informática, 2008 [Spanish]. quency and drug use. Criminology, 40, 359-399. Martínez-Lanz, P., Betancourt, O. D., Rendón, B. L., & Burns, T. A.
varonil. Revista Criminalidad, 5 4, 359-377.
depresión como factores de riesgo en la delincuencia varonil. In R.
types and private and public drinki n g. Addiction, 93, 689-699.
tion. Journal Anxiety Disorders, 17, 165-180. (Boyacá). 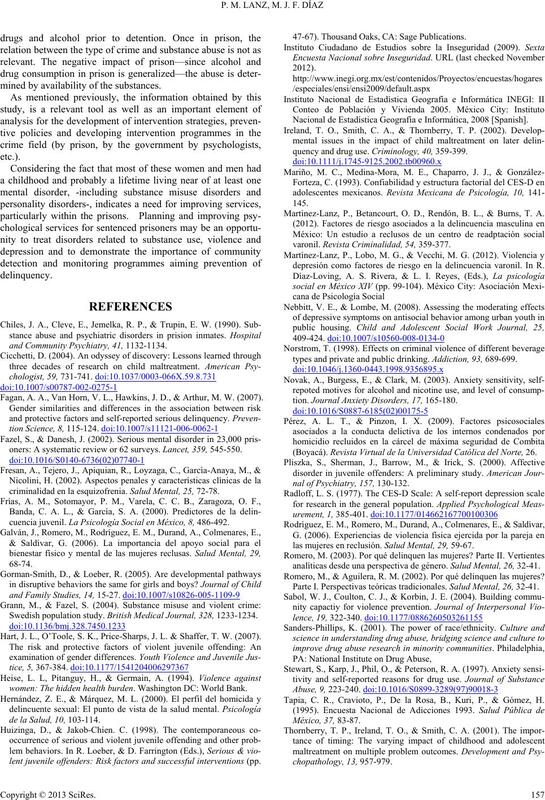 Revista Virtual de la Universidad Católica del Norte, 26.
nal of Psychiatry, 157, 130-132.
las mujeres en reclusión. Sa l ud Mental, 29, 59-67.
analíticas desde una perspectiva de género. Salud Mental, 26, 32- 41. Romero, M., & Aguilera, R. M. (2002). Por qué delinquen las mujeres? Parte I. Perspectivas teóricas tradicionales. Salud Mental, 26, 32-41. Tapia, C. R., Cravioto, P., De la Rosa, B., Kuri, P., & Gómez, H.
Vermeiren, R., Deboutte, D., Ruchkin, V., & Schwab-Stone, M. (2002). nities. European Child Adolescent Psychology, 11, 168-175.
prisoners. 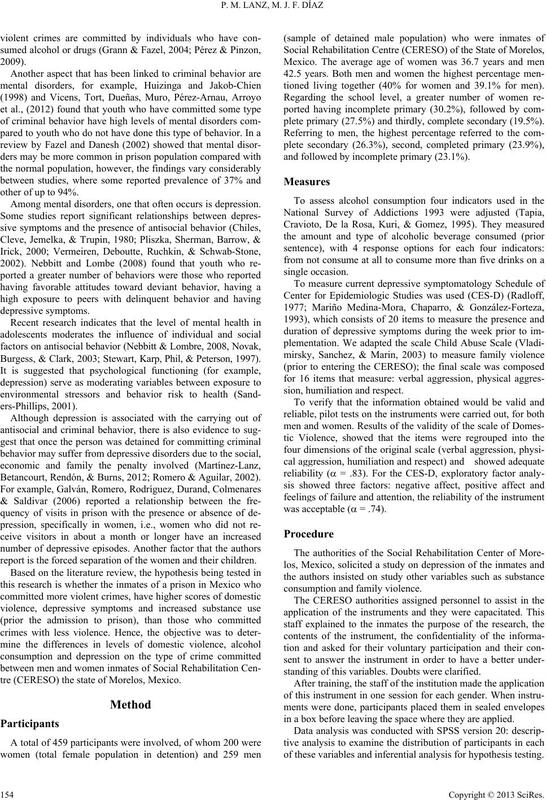 Criminal Behavior and Mental Health, 21, 321-332. Vladimirsky, G., Sánchez, M. O. P., & Marín, C. A. E. (2003). escolar. Tesina de Licenciatura, México City: Universidad Anáhuac. ies in Criminology and Crime Prevention, 4, 162-179.